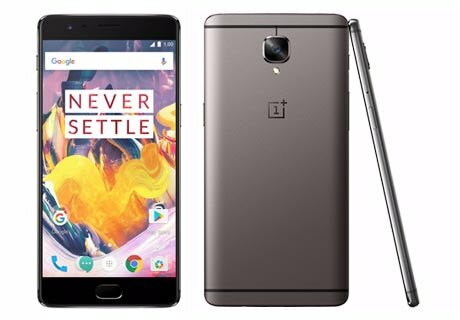 Every year OnePlus Comes up with one Exclusively Flagship smartphone, in 2016 its second Smartphone OnePlus 3T launched with minor improvement over existing OnePlus 3, It has many mind blowing features but there are few Pros and Cons possible customer should know before considering this smartphone. The main features of handset are 5.5 inches Optic AMOLED Full HD display, Snapdragon 821 Processor, 16 MP Primary | 16 MP Secondary camera, 64/128 GB Internal Memory, 6 GB RAM and 3400 mAh battery. OnePlus never sacrifices the design as now it has Premium space-grade aluminum alloy aesthetics body with all-metal build and bold Gunmetal colour. With 7.4 mm of thickness and rounded edge handset has easy gripping. The Fingerprint scanner in embedded with functional home key. Volume rockers are located in the Left Edge while power button found on the right. There is speaker, Type-C port and a 3.5mm headphone socket at the bottom of phone. This phone also has 5.5 inches AMOLED Full HD Display with 401ppi of display density same as OnePlus 3, All the visual content looks sharp and clean in this screen but as the VR Headset are popularizing Full HD display with 401ppi may not look sufficient enough to enjoy Theater experience, However either you work outdoor or indoor in full brightness it always have great visual experience. We are happy to see 16MP primary camera with PDAF, f/2.0 aperture, OIS and 4K Video recording support in this handset. High pixel count is capable to take detail about a scene. The night photographs or low light shots are sufficiently accepted. OIS helping in taking wildlife and sports photograph with better results. 16 MP secondary camera is also pretty good with wide viewing angle to cover more area while taking selfies. The phone comes up with best mobile processor till launch date with whooping 6 GB RAM, There is Snapdragon 821 SoC with 2.35 GHz Kryo Quad-core CPU that is 10% more powerful than Snapdragon 820 sufficiently enough to run any high end game or Application available in Google Play Store. Phone works smoothly in all kind of tasking, The OxygenOS (3.5.3) UI based on Android 6.0.1 is also neat and quick in accessing different tasks. This handset is perfectly suitable for a person searching for Gaming Smartphone with quite sufficient battery and display size/ quality. This smartphone has 3400 mAh battery with facility of Dash charging that can fully charge the battery around 1 Hour and battery can easily stand for 1 full day. Supports Fast battery charging (Dash Charge) can charge phone 60% in 30 min. Body is made up of space-grade aluminum with premium quality. NFC is supported to control different wireless devices. OTG Cable is supported to exchange data from the Pen drive. Immersive Gaming experience with great performance. Display is vibrant enough to enjoy any kind of visual content. There is no slot for Micro SD card. Body is not Water and Dust Resistant. 128 GB Version is ₹ 5000 more expensive just of extending 64 GB Memory. There is No default FM Radio Support to tune your channel. This handset is not so different from the OnePlus 3 but definitely it is kind of Special Edition with better CPU, Higher internal Storage, Higher front facing camera pixels and More battery capacity. There is hardly any noticeable downside in this handset apart from non expendable memory but that can be replaced by the OTG support apart from that phone is great option for a graphic intensive heavy user. However you have also options like Mi 5, Nexus 6P and Samsung Galaxy S6 Edge.